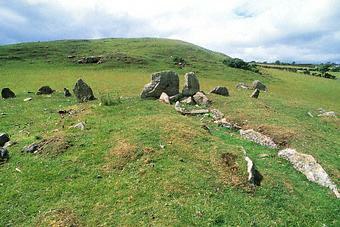 The remains of a horned long chambered cairn in a field near the south coast of the Isle of Arran. The 6.7m long chamber was subdivided into five compartments by upright slabs. The cairn has been robbed but, the stones of the chamber and the forecourt are still visible clearly showing the structure of a so-called Clyde-type tomb (cairn with a forecourt of upright stones). The two portal stones (visible at the centre of the photo) are only 0.15m apart so it is possible that they are a later addition to block the entrance. Two secondary chambers were inserted into the long cairn.